… even if it’s a dress. Somehow I still can’t get over how beautiful my ten days in Malta were and keep looking for ways to share more pictures from the trip. You can see a few of them in my Malta sneak peek, my vegan Malta post, and my outfit post. I thought I’d share a few sunset pictures in which I’m wearing one of my favorite dresses. 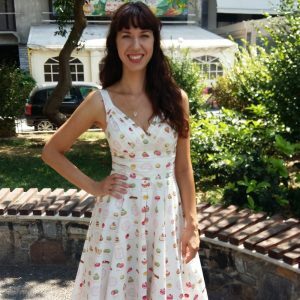 Miss Candyfloss is a Swedish vintage reproduction brand that I really like as they produce all their clothes ethically in Romania. My first dress by Miss Candyfloss was the Izzy Pastry dress I won from TopVintage last year. I already had an eye on the Adelise-Paris dress back then, which is the same style with a beautiful Eiffel Tower print. Given that Paris is still my favorite city in the world (although I don’t like the Eiffel Tower as a building), it was only a matter of time until I got this dress. Like the Izzy Pastry dress, the Adelise-Paris dress is made of 100% cotton which makes it a great choice for the hot Greek (or, in the case of these pictures: Maltese) summer as it’s a lot more breathable than synthetic materials. ​Take a look at these pictures taken before and during the sunset at Malta’s Dingli Cliffs.